Habitat has announced it is to launch a new Brighton city-centre store in October 2018. At 6,500sqft it becomes Habitat’s third largest store in the UK and forms part of Redevco’s redevelopment of the old Hanningtons department store on North Street. This marks the first new major stand-alone city-centre store that the brand has opened in 10 years. 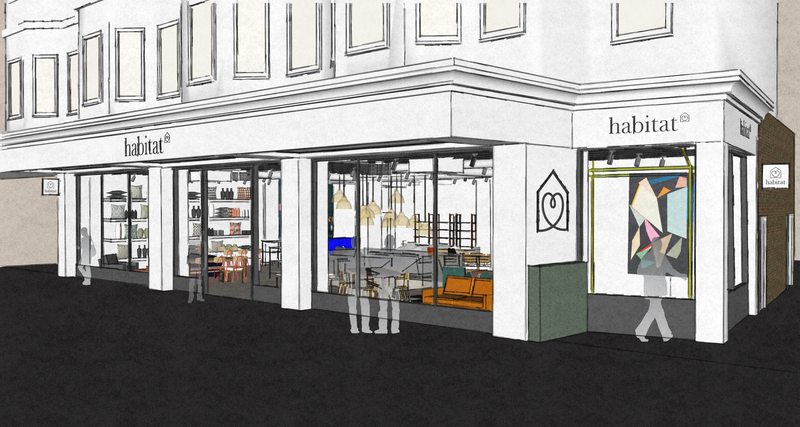 Designed by the Habitat Design Studio, the new store design will be housed across two floors on ground and basement levels of 23-25 North Street, and will offer around 3,000 Habitat products across furniture, lighting, textiles and accessories. The new store will feature striking wraparound store-front windows leading onto The Lanes and will include an installation and events space which will house regular workshops, talks and installations from local collaborators. expected to be completed by the end of 2018. GCW and KLM Retail advised Redevco. © 2017 Hanningtons Estate - All Rights Reserved.